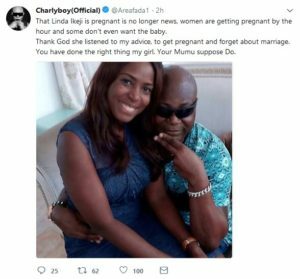 A Nigerian singer/songwriter, television presenter, publisher, producer and one of Nigeria’s most controversial entertainers, Charly Boy, has reacted to the pregnancy news of popular female blogger, Linda Ikeji. Charly Boy thanked Linda Ikeji for taking heed to his advice to her to get pregnant and forget anything about marriage. He also congratulated Linda for getting pregnant. "That Linda Ikeji is pregnant is no longer news, women are getting pregnant by the hour and some don’t even want the baby. Thank God she listened to my advice, to get pregnant and forget about marriage. You have done the right thing my girl. Your Mumu suppose Do."